Item Detail - SCHOOLMASTER TEACHES VIRTUES OF OSBORNE FARM IMPLEMENTS 1896-98 BUTTON. 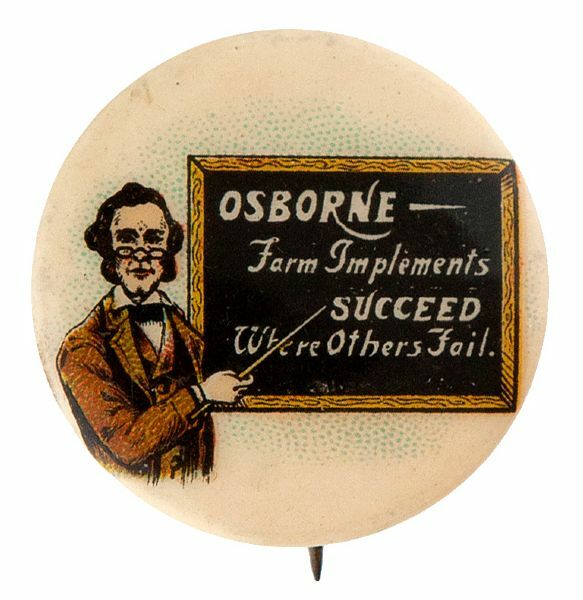 SCHOOLMASTER TEACHES VIRTUES OF OSBORNE FARM IMPLEMENTS 1896-98 BUTTON. 7/8" of gentleman teacher using pointer at blackboard inscribed "Osborne Farm Implements Succeed Where Others Fail." Near Mint displaying Mint.